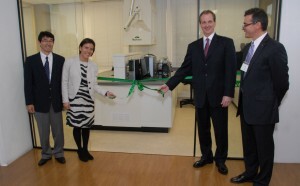 14 December 2012: Malvern, UK: In December 2012, in support of continued, strong business growth in South America, materials characterization company Malvern Instruments opened a new applications and demonstration laboratory in Brazil. Located at the São Paulo facility of Malvern’s parent company Spectris, the new laboratory will provide pre- and post-sales support to customers across all of Malvern’s technology areas, and will augment established particle characterization demonstration labs elsewhere in Brazil. Strong customer relationships and exceptional service are at the heart of Malvern’s business and the company strives to deliver the same service excellence the world over. The establishment of this new laboratory in São Paulo follows the opening in March this year of a brand new Malvern facility in Houston, Texas, which not only serves customers in the USA but supports some of the emerging markets in Latin America.